If you decide on this wonderful bassinet, you will profit from several benefits at once. 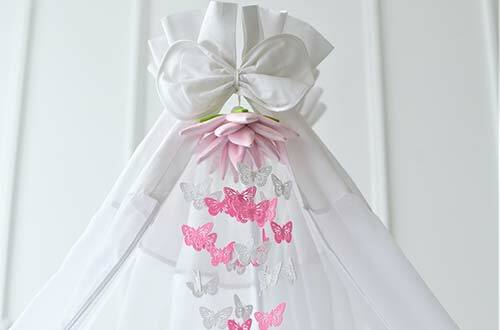 Canopy rods are incuded in the supply, for instance, as is a hinged canopy, loops and comfortable crib sheets. You do not need to worry about blanket or pillow, either, because these products are also included, as are matching covers and the several centimetres thick foam core mattress with a cotton cover quilted on one side. And if you wish, you can order matching fitted sheets from us. A pretty baby mobile is often the first toys that the baby gets to know. Hence, mobiles also belong to the ComfortBaby‘s equipment for the cot, bassinet, cradle or co-sleeper cot. The mobile is meant for watching and wondering. Many different pretty things can be hung up on it. When the baby grows, it will want to move the mobile on its own and reach for it. ComfortBaby has developed different really nice mobiles for your baby. Many of the mobiles belong to the exclusive FourSeasonsDream collections in four seasons look. We create products that can support and promote the emotional attachment to your child. Unmatched comfort, security and safety are our most important principles. ‘In your child’s best interest’ is our premise. We want to ensure safe and reliable products that will give you and your child many years of pleasure. Do you want to get another cot set so that your baby's cot is always fresh and fragrant? We supply wonderful cot sets for the nice, adjustable Smartgrow cot by ComfortBaby in many pretty colours. You may select the cot set for oval cots in white, violet, beige, green, rose or light blue. Just choose the colour that you prefer. The cot set for your Smartgrow cot includes the whole interior equipment for the cot and the later children's bed. If you have ever furnished a baby room, you will know how much joy that act conveys. Pregnant women feeling the new life growing in their wombs may develop a veritable passion for designing the nursery. Colours and accessories are matched to each other. That’s not just about convenience for parents and child but also for satisfying the eye. We have compiled a few tips for you that are not intended to prevent you from developing your individual ideas but to encourage you. No matter what kind of accessories you desire to get for your baby, utmost safety and easy cleaning should be your main incentives. By the way, fathers may also catch fire, and because men are more practically and women more emotionally inclined, the joint work of both can produce a fantastic result! Save 20% on your purchase from 500€. Do not forget to type in the voucher BeşikAksiyonu20P19 in the shopping cart or at the checkout. Do not forget to typ in the voucher BeşikAksiyonu20P19 in the shopping cart or at the checkout. The ComfortBaby® SmartGrow 7in1 - the best sleeping experience from day one. Our cots grow with the children who sleep in them and impress parents with their harmonious curved shape and robust workmanship. The round cot offers your child protection and security and can also be used as a bassinet and is movable thanks to the wheels. The SmartGrow 7in1 offers 7 pieces of children's furniture in one. The SmartGrow 7in1 can be enlarged according to the changing needs of your child. We create products that can support and promote the emotional attachment to your child. Unmatched comfort, security and safety are our most important principles. "Best sleeping experience frome day one" is our premise. We want to ensure safe and reliable products that will give you and your child many years of pleasure.